The appearance and interior of the hotel is what forms its image. 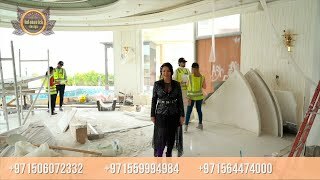 Competent hotels fit-out using quality materials from Luxury Antonovich Design — leading hotel fit-out company in Dubai attracts more new visitors. Our expert team understands that diverse classes of hotels require an individual approach to the design and interior fit-out of the hall and rooms, restaurants and bars. All hotel rooms have high-quality fit-out, using imported, environmentally friendly materials of high wear resistance. For the furnishing of hotels Dubai, our company provides special hotel furniture, which is characterized by increased durability, as well as provides ease of use and cleaning in conditions of frequent changes of residents. Materials for rooms fit-out are durable, characterized by high sound insulation and easy to clean. For upholstered furniture our designers use textured or smooth, monochromatic, high-quality fabrics with a minimum of patterns and ornaments, optimally corresponding to the overall hotel design. Carpeting and marble flooring, especially with ornaments, enriches the color of interior design, and performs the functions of sound and heat insulation. Designers and structural engineers assess the amount of needed interior fit-out work, find out the owners' wishes regarding the style in which the hotel must be presented upon completion of the renovation and fit-out work. Development of draft — a sketch in several versions for approval. Coordination with the customer on the style and quality of construction and fit-out materials. Final design, and maintenance work on the dismantling and redevelopment of hotel premises. Installation of furniture and special equipment. — The interior and exterior of the hotel are made in harmony. This concerns both the style direction and preference in finishing materials. — Fir-out and repair work from Luxury Antonovich Design masters meet strict requirements associated with high maneuverability. Finishing materials are carefully selected, giving preference to examples of high wear resistance and practicality. — The hotel includes a lot of rooms that have different functional load: hotel suites, hall rooms, dining rooms, bathrooms, terraces, swimming pools, etc. The decoration and fit-out of each room meets the same style of the interior, while providing the necessary functionality. — The comfort and safety of hotel accommodation is directly dependent on a well-thought-out communications system — electrical wiring, ventilation, and water supply.